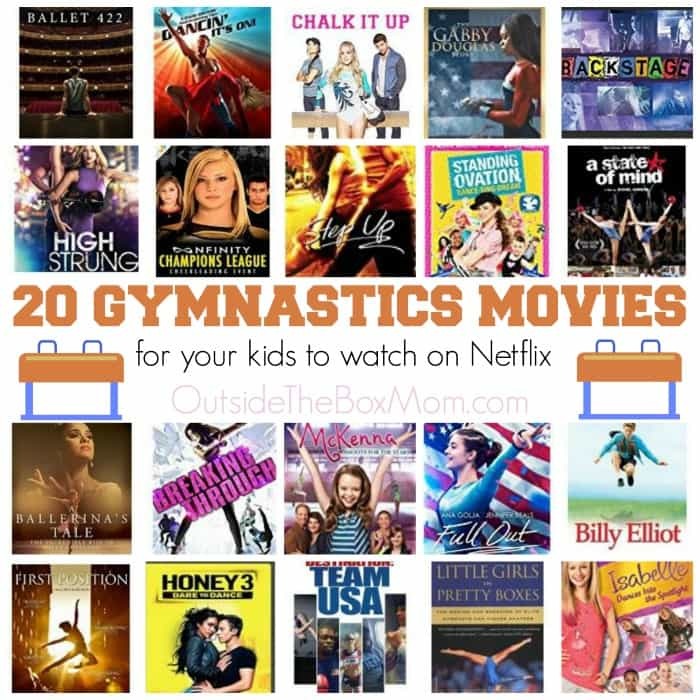 Looking for Gymnastics Movies on Netflix? There are some great titles you can stream on Netflix. These films and TV documentaries are a great resource any time of year. You might also like these adorable mom/daughter gymnastics shirts! When you think about gymnasts, some of these stars come to mind: the “Queen of Gymnastics” Nadia Comaneci, the first US Olympic All-Around Gold Medalist Mary Lou Retton and more recent stars such as Shawn Johnson, Nastia Liukin, and Gabby Douglas. These women are important because they made history and broke records. They are role models to young girls because of their hard work, dedication, and victories. There are so many titles available on Netflix. Whether you’re looking for a TV show, movie, or documentary, you will likely find it on Netflix. Every genre is covered from Kids to Romantic Comedies to Action & Adventure. Although there is not a “Gymnastics Movies” category in the Netflix database, after digging through Documentaries, Historical Documentaries, and Sports, I was able to find these titles. The Horse Dancer (TV-G) – When one of America’s most promising young gymnasts, Samantha Wick, is cut from the Olympic team, she decides to follow her dreams of horseback riding by joining a girls horse camp. Raising the Bar (G) – Kelly swears off gymnastics after moving to Australia, but is drawn back in to help a new friend compete. The experience helps her regain confidence and renew her love of the sport. Barbie: Spy Squad (TV-Y) – Barbie and her best friends Teresa and Renee transform from hard-working gymnasts to undercover secret agents in this exciting, action-packed adventure! Chalk It Up (PG) – When a super girly-girl is dumped by her boyfriend; she decides to do everything she can to get him back by building a college gymnastics team, quickly learning that she is capable of a lot more than just getting an MRS degree. A 2nd Chanc e (PG) – A young girl and her coach overcome adversity to make their way into the National Gymnastics Competition. This gymnast lacks the confidence she needs to reach the top. But with the help of her new coach, she has the chance to win a spot on the national team. Full Out (PG) – The inspiring true story of San Diego, California gymnast Ariana Berlin who missed her chance at the 2008 Olympics because of a bad car accident. Determined to defy all odds, Ariana makes a miraculous comeback and will stop at nothing until she is back in the world of gymnastics. Gabby Douglas Story – Moving away from her hometown and family in 2010 to pursue training with a world-renowned Olympic trainer, Gabby Douglas was selected to compete with the U.S. Olympic women’s gymnastics team at the 2012 Summer Olympics, becoming the first African-American to win gold in the individual all-around event. Destination: Team USA – Follow five of these dreamers, united not only by their pursuit of Olympic glory but by their desire to seek out new experiences and soak up the world around them. An American Girl: McKenna Shoots for the Stars – American Girl McKenna comes to life in this modern-day adventure about a determined gymnast who must focus on her strengths to overcome challenges and find a way to believe in herself again. Isabelle – Isabelle is an inspired dancer, but when her sister and a competitive classmate make her doubt herself, she’s motivated by a famous ballerina to find her own way to shine. Standing Ovation – Standing Ovation brings you on a journey of 5 optimistic friends whose perseverance and passion inspires the American dream in all of us. Have you seen any of these Gymnastics Movies on Netflix? My daughter is a gymnast. I can’t wait to go through this watch list with her to find something to watch together! My 7 year old wants to dance! Hi Raki, nice to see this post “Gymnastics Movies for Kids” which is really very brilliant idea you have thought and I appreciate your thoughts and your work which is very awesome and I excited to watch your gymnastic movie and I hope it will be very fun for kids and youngster also. Thanks for this great article, loved the information.